I often hear the saying ‘Boys And Their Toys’, but after having four of my own, I feel like it should really be ‘Boys And Their Forts’. It seems boys, or at least all four of mine, are biologically programmed to build forts. Almost like clock work, their first fort seemed to signify their ‘christening’ into Toddler-dom. After that, the building never stopped. Without fail, anytime I step foot into one of their bedrooms I find sheets strung up, taped up, tacked up. Up! Bins have been used as room dividers, with blankets for doors, and pillows inside serving as child-sized divans for lounging and comfort. While I love the little kingdoms they create for themselves in their world of blankets and imagination, sometimes we just don’t have time for all the construction, and eventual clean-up, that that kind of creativity requires. When that happens, I go from being the beautiful ‘Mom Princess’, as the littlest son has dubbed me, to the mean old ogre storming the gates. I hate ruining harmless fun. Then I really feel like a giant grouchy, green ogre. Stumbling upon Laura’s idea for an easy, DIY Bunk Bed Fort was a Godsend. It’s fast, easy, and there’s not a single thing to cut or sew! You can literally throw it up in 5 minutes. There’s not even a mess to clean up afterwards, and it’s always ready and waiting to play. Perfect for any ‘Mom Princess’ or ‘Queen of the Castle’, whether you’re raising young lords or little ladies, who wants to keep letting the good times roll, even when you’re running out of time. Slide your curtain rings onto the tension rod. Mount the tension rod to the bunk bed. 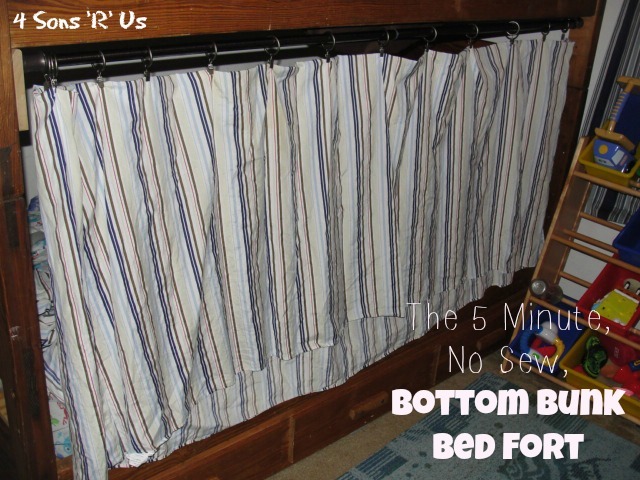 Fold your twin-sized, flat sheet in half, lengthwise. Attach the clips on the fold, spacing them as evenly as possible so the whole sheet is evenly held up. Look how it works. 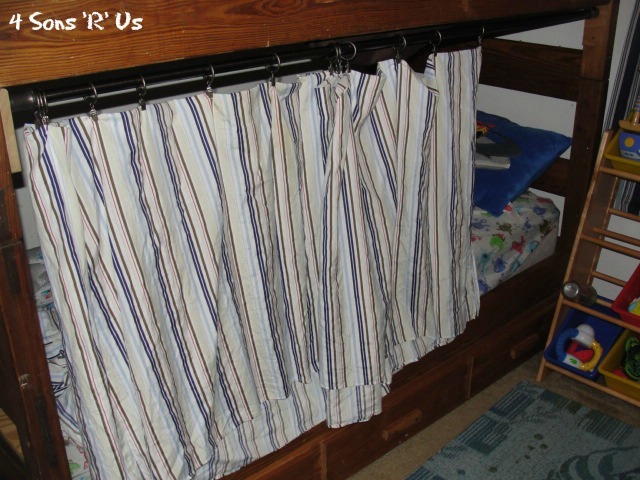 The curtain can be all tucked away when not in use, but just slide it closed for your very own Bottom Bunk-Bed Fort. The sheet easily un-clips for washing, and the tension rod is equally easy to remove whenever desired.